Sydney Sixers 124 for no loss (Michael Lumb 82*, Brad Haddin 37*) beat Highveld Lions 121 (Jean Symes 51, Dwaine Pretorius 21, Josh Hazlewood 4-22) by 10 wickets. Highveld Lions reached 121 before their innings was folded back in 20 overs and Sydney Sixers piled up 124 runs without losing any wicket in 12.3 overs. 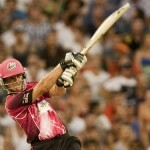 Michael Lumb (Sydney Sixers) was declared ‘Player of the match’ for his stormy unbeaten innings of 82 off just 42 balls. 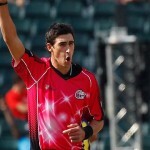 Mitchell Starc (Sydney Sixers) was declared ‘Player of the series’ for his excellent bowling. He grabbed 14 wickets in the tournament at a superb average of 12.35 runs per wicket with the best of 3-19. The final of the Champions League Twenty20 2012 was played on Sunday, October 28, 2012, at New Wanderers Stadium. Earlier, Brad Haddin, the captain of Sydney Sixers, won the toss and decided to field first. The decision paid off right away as his bowlers tore apart the top order batting line up of the Lions who were reeling at 4-9 in 3.3 overs. Their skipper, Alviro Petersen and Quinton de Kock scored just one run each, Gulam Bodi was gone for six run and another prominent batsman, Neil McKenzie, was unable to open his account. Jean Symes and Sohail Tanvir tried to establish the innings and the first added nine runs in the fifth over with a couple of fours. They took the score to 32 in seven overs when Sohail Tanvir was declared leg before wicket off Nathan McCullum for 11 runs. Thami Tsolekile joined in next with Symes who was fighting well at his end and got another 3 fours until the tenth over. Tsolekile dispatched the first six of the innings in the 11th over and got another 10 runs in the next over with 1 six and 1 four. He was caught excellently on his knees at short mid wicket by Steve O’Keefe off Nathan McCullum for 20. The score touched 6-73 in 13.3 overs as Dwaine Pretorius took guards in the centre and sent the first ball reeling out of the fence. Symes gathered another 2 fours in the 16th over and Pretorius hit a six on the first ball of the following over. Jean Symes was dropped on the last ball of the same over at 49 and he attained his maiden T20 fifty in the next over. The pair lifted the score to 111 after 17.5 overs as Dwaine Pretorius was run out for 21 off 13 balls with 2 sixes and 1 four. Jean Symes was caught behind by Brad Haddin off Josh Hazlewood for 51 scored on 46 balls with 8 well timed fours. Highveld Lions managed 121 runs before they were bowled out in exact 20 overs. Nathan McCullum and Josh Hazlewood were the top wicket takers with three wickets each whereas Steven O’Keefe and Mitchell Starc claimed one wicket each. Michael Lumb and Brad Haddin initiated the innings for Sydney Sixers with alertness and scored just eight runs in the first three overs. They opened up in the following over with 3 fours and kept on creeping with the odd boundaries. Lumb got a life when he was dropped by Gulam Bodi at long-off on the bowling of Aaron Phangiso at 21 runs in the seventh over. Both batsmen changed their gears in the next over, added 17 runs with 1 six and 2 fours and Lumb punished Phangiso for 19 runs with three consecutive fours and one six in the 9th over. Michael Lumb notched his 14th T20 half century in the following over and carried on his blitz by hitting two sixes in the next two overs. Haddin continued assembling runs from his end and added seven runs in the 12th over with one four. Lumb did not wait for a long time, smashed 2 back to back sixes on the first two balls of the 13th over and hit a four on the third ball. The target was achieved by hammering 124 runs with 45 balls to spare. Michael Lumb remained unbeaten for 82 off 42 mere deliveries with five giant sixes and 8 fours as Brad Haddin secured his end at 37 off 33 comprising 1 six and 4 fours. Sydney Sixers won the final with a huge margin of 10 wickets and clinched the elegant trophy.